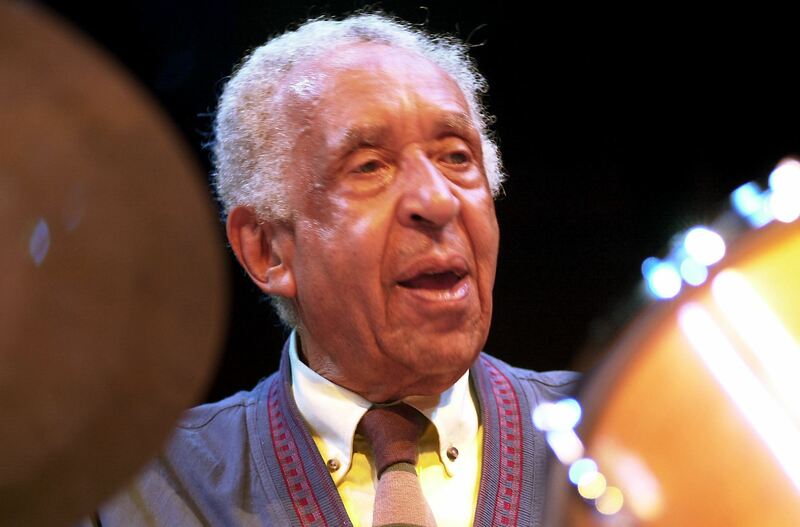 Joe Harris was still in his teens when he hit the road from his native Pittsburgh for a globe-trotting career as one of the most versatile jazz drummers of his time, one of the last survivors of the golden era of bebop. Even in his last years after returning to Pittsburgh, when he tapered back his performing schedule, he continued to practice daily and mentor younger jazz musicians. Mr. Harris died Wednesday at age 89 at Allegheny General Hospital. He had been in good health until recently but began having shortness of breath a week earlier followed by other complications, said his sister, Barbara Randall, who shared a Manchester duplex with him. His story can’t be told without dropping names from a who’s who of jazz greats at every turn. A onetime member of trumpeter Dizzy Gillespie’s band, Mr. Harris also accompanied Charlie Parker, Ella Fitzgerald, Sarah Vaughan, Sonny Rollins, Stan Getz, Billie Holiday and other greats. “The top rung of musicians in the jazz world, Joe played right along with those people,” said Jimmy Heath, a saxophonist, band leader and composer who toured with Mr. Harris beginning in the 1940s and spoke to him by phone a few days before his unexpected final illness. “He was just an interpreter of the music who was very good at doing that, giving you what you wanted and needed for support,” Mr. Heath, of New York City, said. Mr. Harris was part “of the generation that created the music” of the mid-century flowering of modern jazz, added Nelson Harrison, founder of the Pittsburgh Jazz Network and a trombonist who often performed with Mr. Harris. Mr. Harrison said that when the legendary jazz drummer Roy Haynes performed at the New Hazlett Theater on the North Side two years ago, he called Mr. Harris to the front, embraced him and offered him his drumsticks, asking the Pittsburgher to play first. In addition to many gigs across America, Mr. Harris also lived in Sweden, where he married and where his daughter still lives, and for periods in Germany and Japan before returning home. Ms. Randall — who was 18 years her brother’s junior and sang in a band accompanied by Mr. Harris during an extended European trip that was his high school graduation present to her — said her brother was “very proud” and guarded his privacy but that his mind was sharp to the end. He lived frugally, rode his bike from his Manchester home as recently as last summer and played tennis into his mid-80s. He taught himself to speak Swedish fluently and learned a fair amount of German and Japanese, his sister said. Joseph Allison Harris was born Dec. 23, 1926, to Joseph and Bertha Harris of Manchester. The elder Mr. Harris was among 28 people killed the following year in one of Pittsburgh’s worst disasters, the massive Equitable Gas tank explosion on the North Side. Young Joe and another brother, Robert, were raised by his mother and their stepfather, Lee Randall, after she remarried. Robert died in 1977. Joe Harris took lessons at an early age from Pittsburgher Bill Hammond, an acclaimed master of traditional rudimental drumming. That formal training, added to later experience with a variety of Latin and other rhythms, stood Mr. Harris well, Mr. Heath said, enabling him to sit in with a band or orchestra and quickly sight-read almost any style of music. By his mid-teens, Mr. Harris was playing in big-band ensembles and touring the country. A former Pittsburgh band mate, bassist Ray Brown, joined Mr. Gillespie’s pioneering bebop band and arranged for Mr. Harris to audition for an opening at the drums. Mr. Harris’ work is immortalized on many of Mr. Gillespie’s recordings from that era. That includes a 1947 concert at New York City’s Carnegie Hall that has entered jazz lore, featuring an especially intense set with Mr. Parker and Mr. Gillespie. But not long after that show, Mr. Gillespie fired Mr. Harris when the drummer demanded in front of the whole band that Mr. Gillespie pay overtime for a rehearsal, according to a 1995 profile in the Pittsburgh Post-Gazette. The two later reconciled. In 1986, Mr. Gillespie performed in Pittsburgh and invited Mr. Harris up to jam. Mr. Harris’ services remained in high demand. Vintage videos of Mr. Harris’ performances show a man at once confident, graceful and understated at the drum set. In 1956, during a tour of Sweden, he met Marianne, the Swedish woman who would become his wife and give birth to their daughter. He lived and worked there five years. And like many other African-American jazz expatriates, he welcomed the contrast from the racial prejudices of the United States. But one of his great regrets, he later said, was the failure of his marriage. He left Sweden but continued to visit his daughter. “My father was loved by the Swedish jazz community, both when he lived here and later when he visited us,” said his daughter, Malou Harris Meilink, who is herself a musician as are her daughter, Linnea, and son, Vidar. “Many younger players were inspired by and studied his playing,” she said by email. Mr. Harris later toured Europe with a band led by Quincy Jones and eventually joined a state-run band at Radio Free Berlin. He traveled extensively, including a year in Japan on a study grant, learning folk music traditions of Asia and Africa. He spent his last decades at his Manchester home, teaching jazz history and drums for years at the University of Pittsburgh. Funeral arrangements were still in progress on Sunday. A special man, musician, drummer and inspiration for me whenever he came home from touring with Mr. Gillespie. He will be missed and remembered! "Things To Come", no one could perform that like Mr. Harris!!! I instruct these young drummers to get the video and listen and look, and learn. The heavens Will beat forever. at the Flying Carpet out by the old airport. I had worked with him all summer. He was a prince of a musician and human being. I know he is with the Lord. A long life with outstanding achievements. On Friday February 12, 2016 a church memorial service will be provided by Metropolitan Baptist Church for those who would like to experience religious closure of Joe's passing. Time of the service to be announced ASAP. So sorry to hear of Joe's passing. He was a great man and drummer. I played my last professional bass job with him in Pgh at the Sqawkers Club. What a loss to the earthly music scene.